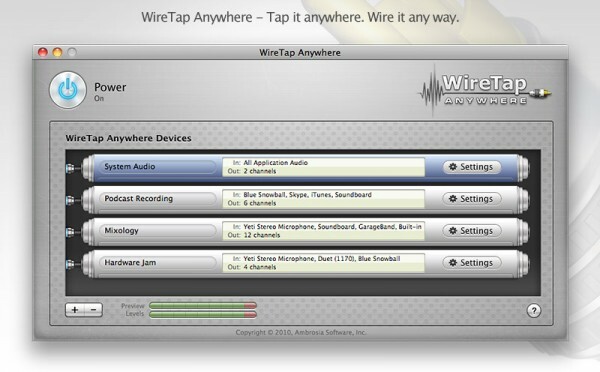 Ambrosia Software has announced the release of WireTap Anywhere 2.0, a major update to the audio routing and mixing software – a popular tool for Mac-based podcasters. WireTap Anywhere can take the audio output from any combination of Mac applications or hardware input devices, and route it into your favorite audio processing applications. Create virtual input devices with an arbitrary number of channels of audio. Discretely map audio channels from software applications and hardware devices in any combination you choose. Adjust audio levels on a per-channel basis both pre- and post-mix. Preview your audio mix before you ever hit the record button. WireTap Anywhere is available now for $129. Registered users of WireTap Anywhere 1.x can upgrade to version 2.0 for $69.